Washington - The father of a student killed in last week’s Florida school shooting on Wednesday told President Trump “I’m pissed” and said the Trump administration has to prevent tragedies like school shootings from happening again. “We as a country failed our children. This shouldn’t happen,” Andrew Pollack told Trump during a listening session at the White House. He went on to say the country reacted quickly to the terrorist attacks on Sept. 11, 2001. Pollack is the father of Meadow Pollack, who was killed last week at Marjorie Stoneman Douglas High School in Parkland, Fla., when Nikolas Cruz allegedly opened fire with an AR-15 rifle. The shooting resulted in the deaths of seventeen people and others injured. “We have to come together as a country, not different parties, and figure out how we protect the schools. It’s simple. It’s not difficult. We protect airports, we protect concerts, stadiums, embassies, the Department of Education that I walked in today that has a security guard in the elevator. How do you think that makes me feel?” Pollack continued. The president did a great thing holding this meeting and seems very sincere in wanting to make real changes in o enhance security against gun violence. And no sooner was the meeting over that I checked to see what possible negative reactions would no doubt be expressed by the 24/7 Trump hating shameful media, in particular CNBC and CNN. Well, they didn’t disappoint. Their “brilliant expert”commentators basically all had the same thing to say, “Yeah it was A nice meeting but I don’t believe the president will do anything, just like he doesn’t do anything about any other issue.” What a shameless embarrassment these sick hateful hypocrites are. They had no problem with, and had no criticisms for any violence that took place during the Obama administration. They have rendered themselves completely dishonest, biased and useless. They should be avoided at all cost for you will never hear any real news or honest reporting from them. Boo-hoo CNN complained that they invited Pres. 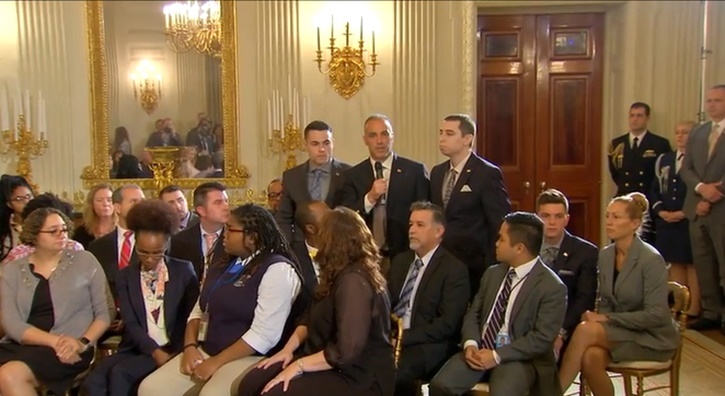 Trump to their town hall meeting tonight regarding the recent gun shooting in the school, and he turned them down and made his own meeting in the White House, which was very touching and very effective. Poor biased CNN got shut out and preempted and so now they have something new to criticize the president about; they’re completely irrelevant, completely biased and FAKE NEWS! I’m so glad Pres Trump turned them down; they would’ve turned it into a Trump bashing spectacle and he’s smart for not agreeing to be a part of their farce. Feh. Grow up. The guy lost his teenage daughter to a senseless murder. No one should ever know what he is going through. This article is extremely misleading. It's not even from another source it was written by Vos is neias staff. The article fails to mention that Mr Pollack is actually a trump Supporter and the headline is trying to imply that he is blaming it on trump. Mr. Pollack was 100% right, when he stated that "we took care of the 9/11 problem, as I can't even get on a plane, with a bottle of water". He also stressed that this most recent mass murder, should never have been allowed to occur; to quote him it was done by "an animal". I agree, though, that he should not have spoken some of the language which he used. I understand that he is grieving, and it must have taken a lot of strength for him to have attended that meeting.